Restore your confidence and get back your smile with our new patented Temporary Tooth Kit. 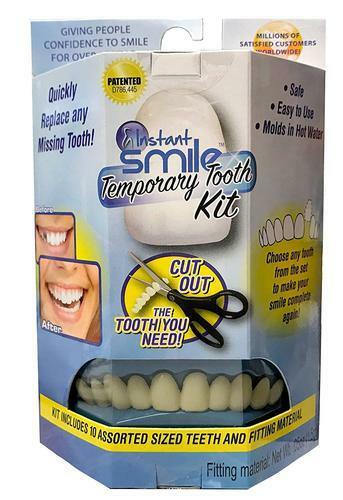 Unlike the alternatives on the market, this kit actually contains ten various sized simulated teeth all molded in the shape of real teeth. Simply select a tooth, remove it from the set, add the fitting material and then insert it where your missing tooth is! You can replace any missing tooth in less than 5 minutes with an actual realistic looking molded temporary tooth. Many other tooth replacement kits only come with beads that you have to form into the shape of a tooth. Many times the beads stain very quickly and need to be replaced often because they become discolored. With our patented Tooth Kit, the temporary tooth does not stain so you don't need to keep purchasing more material because the tooth becomes too discolored. You can wear the same tooth as long as you need to! No product out there has a track record like Instant Smile Teeth does. For more than ten years, our company has given millions a secure smile! The Only Temporary Tooth Molded in the Shape of an Actual Tooth! Bonus Bag of Impression Material Included! Safe and tested to cosmetic standards. Works for a missing upper or lower tooth! Easy to fit in just minutes! Patented! The Most Realistic Temporary Replacement Tooth Available. No Need to Mold Fitting Beads into the Shape of a Tooth! You get the teeth too!